Size 18M Denim Overalls With Long Sleeve Polo. Disney Mickey & Co. Shirt Is Long Sleeve Polo - Heather Blue. 55% Cotton - 45% Polyester. This set is the perfect gift for any baby! Contains bodysuit with matching bib and pant. Machine Wash. Features & details. Material: 100% cotton. Color: blue. 24" length. Please do not make offers, price is firm! Shirt and shorts. Free economy shipping! 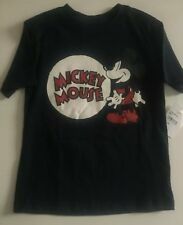 Toddler Boys Disney Mickey 2pc Outfit Set Size 2T. Condition is New with tags. Shipped with USPS First Class Package. DI S N E Y MI CK EY MO US E CLUBHOUSE "DISCOVER EXPLORE LEARN PLAY" BOYS OUTFIT FITS SIZE 12 months. 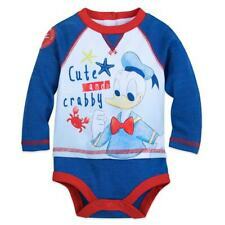 THE MAIN COLOR OF THIS OUTFIT IS NAVY BLUE WITH MICKEY AND DONALD DUCK DESIGN. THIS SET INCLUDES 1 T-SHIRT AND 1 BLUE JEANS SHORTS. Navy Blue, Turquoise, White Short-Sleeve Shirt, McQueen Picture "Drift Star". Disney/Pixar Cars 2pc Short Set. 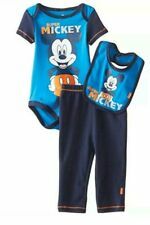 Three-piece Mickey Mouse set set includes graphic short-sleeve creeper, matching snap-back bib, and solid pant with contrast coverlock stitching. Lap shoulder on creeper. Elastic waistband on pant. Machine Wash.
•Padded Warm Blue Striped Overalls. •Snap Crotch on Shirt and Overalls. •Pooh, Little Roo & Mama too! •Walt Disney. Precious Cargo Presents 3 Piece Fall/Winter Boys outfit by SWIGGIES. 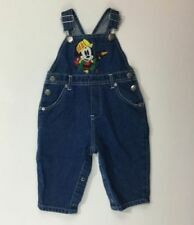 Brand new disney mickey mouse boy one piece . Condition is New with tags. Shipped with USPS First Class Package. Mickey Mouse 3- piece set includes: one creeper one bib and a sleeper. SIZES IS BABY SIZES 12 MONTHS TO 24 MONTHS. 100% COTTON. SHORT SLEEVES WITH SHORTS. STYLE: 307P. Has a picture on Tigger embroidered on the one leg. Toddler size 4T. (Disney Cars set features Lightning McQueen & his friend Towmater. at the Piston Cup Racing Series. Lightning McQueen. ~DISNEY CARS LIGHT UP SHORT SET~. Your lil guy will adore the Light-up Tee -mine does =). 2 Piece Set. Cotton Blend. 3 PC SET, THE TOP IS AN BLUE/WHITE TIE DYE. THE FRONT HAS A PARK PICTURE W/AN EMROIDERED MICKEY RIDING IN HIS CAR. ON TOP IT SAYS JUST CRUISING AROUND. SHORTS HAVE AN ELASTIC WAIST W/LIGHT BLUE STITCHING TOP, SIDES AND BOTTOM. 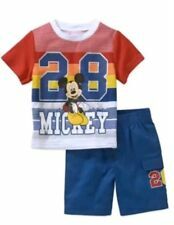 New Disney Mickey Mouse Tee & Knit Shorts Outfit, 60% Cotton, 40% Polyester, Short Sleeve Tee with "Little Prince" on the front, Shorts pull-on with elastic waistband. Available In Infant Boys Size 0-3 Months. It's against the law and we will not do it. All Other Countries. United Kingdom.